Time for a bit of fun! 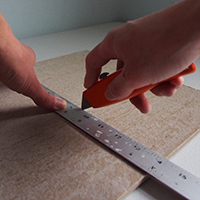 In Piece by Piece (Part 1): Creating a Mosaic Base, I discussed making a substrate for a custom mosaic tabletop from a piece of cement board. So, at this point I am assuming that you have some sort of object on which to mosaic, be it cement board, HardieBacker board, Wedi board, concrete or the like. ​​And now the real work begins! It’s always exciting when the prep is completed, and your prepared blank canvas (or HardiBacker tabletop, as the case may be) is set before you awaiting embellishment. Ah, the potential! The endless possibilities! 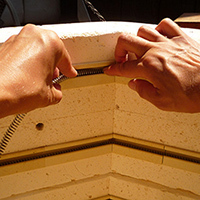 The Tile Making Process page in our About section outlines the techniques we use to create out tiles. 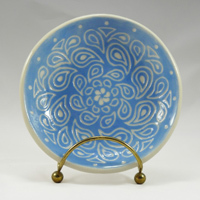 Some of the tiles, plaques, coasters, etc that Blue Willow Studio creates are made as one-off items, carved or decorated individually (like our Leaf Impression Plates or Sgraffito Plates). 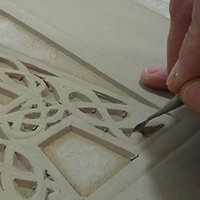 However, we also use the traditional technique of tile pressing from plaster molds. 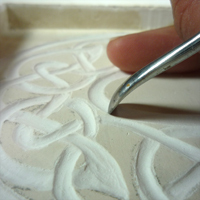 A plaster mold is created from an original tile. 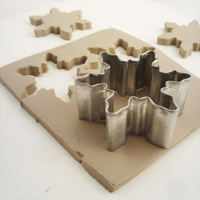 The mold is then used to accurately and quickly replicate the tile in order to produce copies that present a more affordable tile option. That is the question (though methinks I may have misquoted). This is a weighty question; a question whose answer can lead to easy breathing, or health issues down the line; a question that can affect glazes and kiln hardware. And, it’s a question, I admit, I have struggled with over the past couple years. 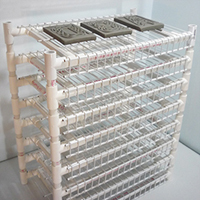 In theory, I am resoundingly in favor of venting my kilns, primarily for safety reasons. 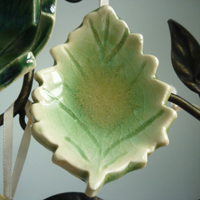 When clay and glazes are fired, toxic fumes are produced, including carbon monoxide, sulfur compounds and metal vapors. And if the kiln is located in a living or working area, the unmitigated fumes can pose health risks to residents. Disaster! Well, perhaps I exaggerate a bit – there were no tornadoes or tsunamis, no fires or floods, no permanent damage to self or property, so really, I am quite fortunate. But, when both your production kilns decide to break at the same time (mere days before an important show), ruining numerous ceramic pieces that had been months in the making, it’s more than a bit of bad luck. Needless to say, I was more than a little upset having lost a couple hundred hours of work and the focus of my exhibit for the upcoming show, but what can you do? These things happen. It is difficult to stay indoors when the October sun is warm and bright, and the transitioning leaves paint the trees in rubies and golds, greens almost of spring and ruddy browns. The forest calls with its sweet scents, and my feet itch to walk amongst the scattering leaves that, liberated from their branches, flutter like petals. And I wander, gathering inspiration. But on the overcast days, when the chill showers dampen the grass and clouds obscure the brilliance of Autumn, my studio is my refuge, and I bring inside, from the rainy outdoors, the idealism of the fall. 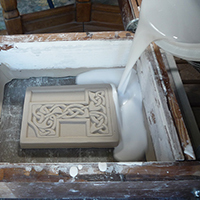 Fair winds are blowing; the stars are aligned; good omens prevail; and I am finally ready, at long last, to complete Part 2 of the Celtic Number and Alphabet post begun with Carving Plaster back in October 2013! Congratulations are due, or perhaps admonishments, since I completed the tile sets a year or more ago. Be that as it may, I am sure the world is just dying for instructions on my knot letters. So, without further ado, on to the how-tos! Early on in my ceramic journeys, I realized that I needed a lot of storage: caddies for tools, boxes for brushes and applicators, bins for sponges and ribs, nooks and crannies for glazes and clays, shelves for bisqued and finished ware, and of course racks for drying my newly-made tiles, hot out of the molds. I scrabbled and scrounged, and cobbled together a mismatched assortment of second-hand storage containers, anything I could find from wooden Clementine orange crates (stackable and great for storing small bottles of glazes or raw materials), to old cigar boxes (brushes and miscellaneous items). 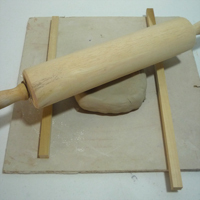 Ah, the slab: a flat sheet of clay, usually rolled to a uniform thickness, plain and boring. But this unexciting slab holds so much potential! 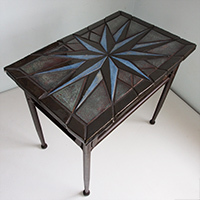 From here spring vases and planters, ornaments and tiles of myriad shapes, sizes and designs. 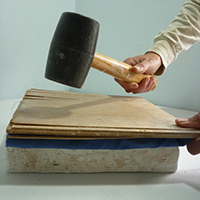 Limitless possibilities flow from the humble slab, and creating one is quite simple. The winter holidays are three months past, and after a season of almost constant snow here on the East Coast, everyone is waiting impatiently for spring. So, perhaps it is a bit late to be posting a project about snowflake ornaments (yes, I am once again behind in my posts). Ah well. Here goes anyway! The Ned Foltz workshop (described in Sgraffito Plates, Part 1) got me quite excited to create more sgraffito plates, so, of course, I went straight to my studio to experiment a bit on my own! In addition to having fun playing around with sgraffito, I also wanted to figure out what types of clay would work best with the technique (not as exciting, I know). My standard clays, a red stoneware and a cream stoneware, both contain grog (small grains of clay that have already been fired). I love working with grogged clay because my tiles are much less likely to warp than if I used perfectly smooth clay. But grog has drawbacks too. Ever since I spent a year in Ireland, I have been enthralled by Celtic knot designs. There is something exceedingly captivating about the intricacy of the weaving lines creating beauty and motion with a sense of whimsy. I began to create my own designs, and a number of years ago I decided to design a Celtic knot alphabet and number set.